Confusingly good fun at first, Dragon Quest Heroes soon falls into a familiar, inane rhythm. Dynasty Warriors' audience will at least get something out of it. What is it: A game that would lead to magnificent finger muscles, were that a thing that existed. There's been a slow trickle of Dynasty Warriors games released on PC over the last decade, along with just one Dragon Quest game. So it wasn't really a foregone conclusion that we'd see the DW/DQ crossover Dragon Quest Heroes: The World Tree's Woe and the Blight Below. But would you believe it: it's here, and it's not a terrible conversion, though it does mainly involve hitting one button for dozens of hours. After powering through the too-long intro and endless nattering, I found Dragon Quest Heroes surprisingly fun. It's polished and responsive, and while it's functionally a reskin of Dynasty Warriors' army-massacring hack-and-slash combat template, Heroes also offers some thematic connections to the decades-old JRPG series that it's based on. This is an action RPG that sees you and a team of up to three others—all of whom you are free to switch to at any time—battering their way through hundreds of monster enemies. In every single level. You do this by hitting one attack or another, more powerful one, before building up your tension meter and using it to unleash an all-powerful coup-de-grace attack. There's the ability to summon support units—they can defend an area, launch a one-off attack, heal your party and so on. That's about it. 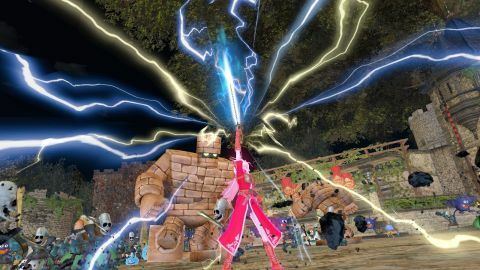 The setting stops Dragon Quest Heroes from losing its appeal much sooner than it would otherwise. The look and cheeky anime feel of the Dragon Quest series has been carried over flawlessly, making this a rare Dynasty Warriors-style game that doesn't have flat textures and graphics that look about a decade out of date. There's something adorable yet also deeply unsettling about a giant, cutesy troll with its tongue hanging out murderising your entire party in one or two hits. The spirit of Dragon Quest has been retained, then—but while the character design and art direction is appealing, the story is almost irritating enough to spoil that goodwill. Dragon Quest Heroes suffers through some of the most trope-heavy, inane storylining I've seen in a long time. You can, and should, skip as many cut scenes—and sections of extended, in-game dialogue—as you can, because good lord they pop up a lot, and are absurdly long in telling the basic tale of chosen youngsters, ancient evil and kings who say 'RAHAHAHAHA' a lot. It's also a shame that the action feels so old, so fast. The initial buzz quickly wears off as you realise that, once again, you're doing exactly the same repetitive button-mashing thing as before. You start a level, kill some monsters, see portals appear which need to be closed (by killing monsters), fight off some larger units and—often, but not always—have to defend an item, area or person. I kept thinking, as my party picked up more and more characters, that things would mix up; the action will develop into something more. But it doesn't. It wouldn't be so bad if there was anything even tactical or challenging about Dragon Quest Heroes, but there isn't. You're told to attack weak points, but you just end up hammering attack. An enemy is stronger than the others, but you just end up hammering attack. You go on a treasure hunt, but you just end up hammering attack. It's a fast track to a waking coma. There's also a very strange oversight in Dragon Quest Heroes: a complete lack of multiplayer. With the game being entirely hub-based, moving from a central base-hub to a contained world-hub means it has elements in common with the likes of, say, Guild Wars 2—but there's no partying up here. With four people hacking-and-slashing (tap-tap-tapping endlessly) together, there'd actually be a lot more fun to be had with the game. As it stands, you're very lonely in your (tap-tap-)tapping; a problem that wasn't actually present in Dynasty Warriors 8. An odd choice. The port from PS4 to PC has been handled pretty well, that much I can say. It's not flawless, though: you see Xbox button prompts on-screen regardless of how you're controlling it, for example, and your selection of resolutions is limited up to 1080p. But generally speaking this is pretty good, if unspectacular, and it runs well enough that I didn't encounter any serious performance issues or crashes—even if it has confused many folks by demanding a minimum of an i7 (a years-old i7, that is). While initially fun, Dragon Quest Heroes is just too repetitive. For Dynasty Warriors fans, this is an equally adequate, brain-off button masher. Diehard Dragon Quest fans aside, though, it's hard to figure out who Heroes is really for. The truly curious are better off waiting for a Steam sale.